Konicas forefather, Konishi Honten, was established as early as 1860, thus being one of of worlds oldest photographic companies, as photo articles of the time was produced from day one. Konica (KONIshi CAmera released their first PP SLR in 1960, the F. From the start to finish they were innovative and among other highlights was this Autoreflex from 1965/66 with automatic aperture based on CDS metering outside the lens. 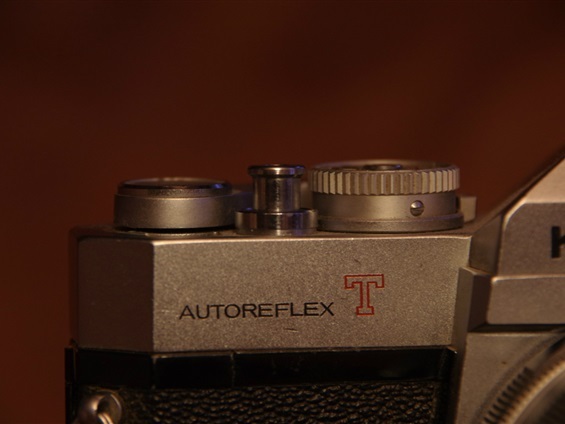 Only two years later the Autoreflex T presented worlds first open diaphragm TTL automatic aperture based on the chosen shutter speed, later known as "Tv". The Autoreflex was developed further into the 70s, selling quite well but never really challenging the big ones. 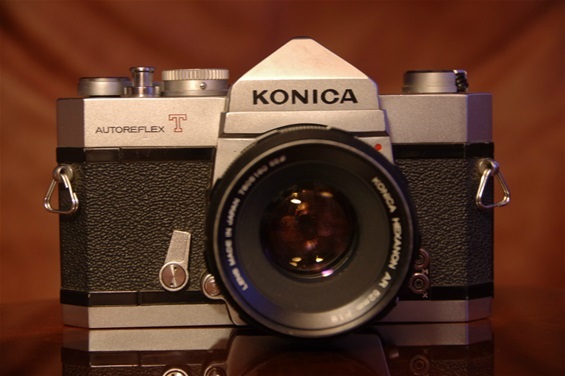 So, during the late 70s and into the 80s, Konica found the competition so tough, especially as the competitors presented well working auto focus cameras, that they quit the PP SLR cameras during 1987 to concentrate on compact 35 cameras. 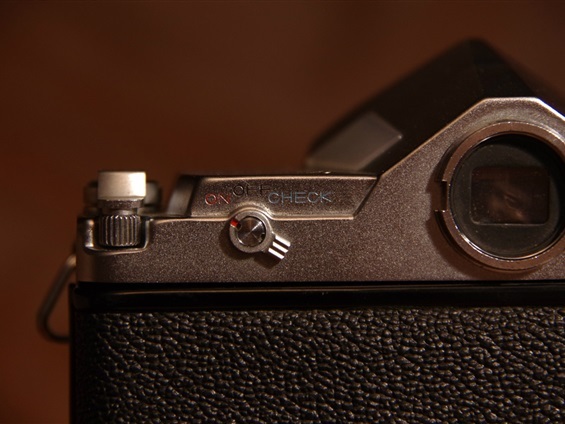 However, the brand would turn up again on PP SLRs after merging with Minolta in 2002. 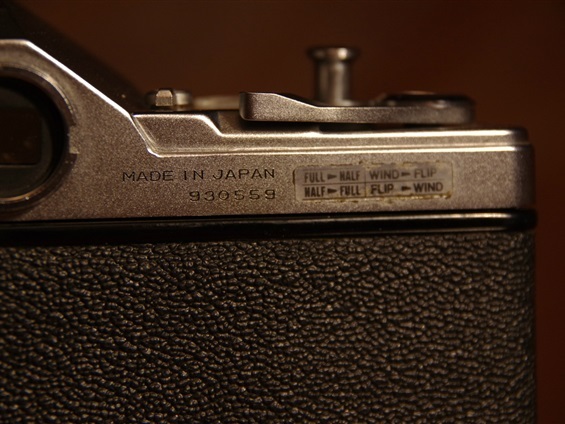 So, the PP SLR cameras wore the name Konica Minolta for a few years until the camera division was sold to Sony, who carried on under Sony label. 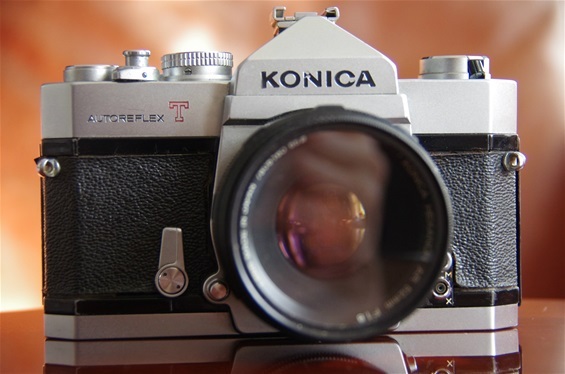 The Konica F was launched in 1960, presenting a vertical metal pre Copal Square shutter, unlike the horisontal fabric curtain shutters used by most others. This included a shutter time of 1/2000 and a flash sync of 1/125, both worlds first. 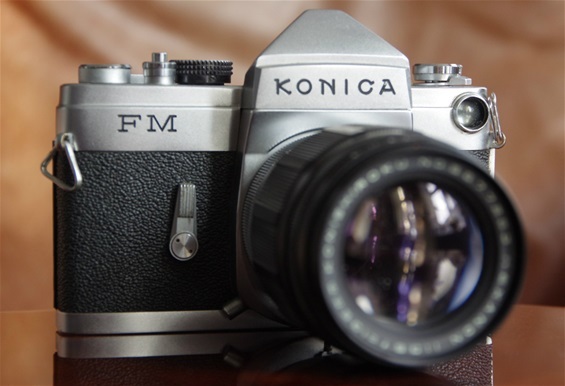 The Konica FM was the last of the F series, presented in 1964. 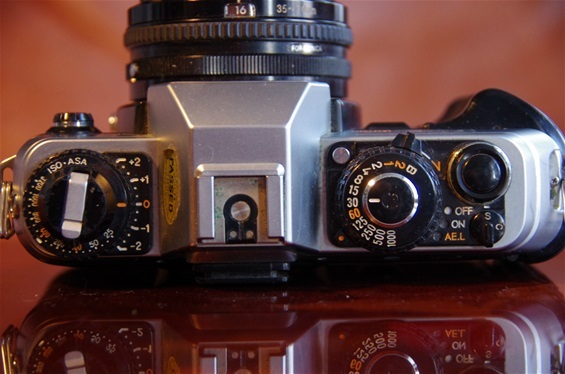 The FM featured an uncoupled CDS meter, located at the cameras upper left, similar to Minolta SR 7 of '62 and Mamiya CPH of '63. Weight: 803 grams. Size: 150x102x45 mm. Sn. 3816375. Konishiroku Hexanon 135/3,5 tele for F-bayonet series. Sn. 5677263. The meter: Off, H(ighlight), L(owlight). Aperture values would be seen in the window. 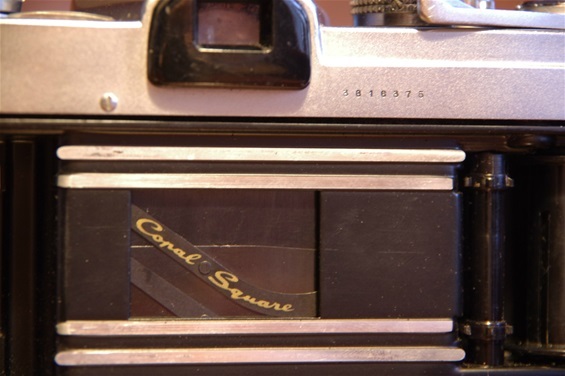 The Copal Square shutter. Others started using that in the 70s and 80s. Konica meant quality and innovation. Here is the first in the influential Auto-Reflex series. 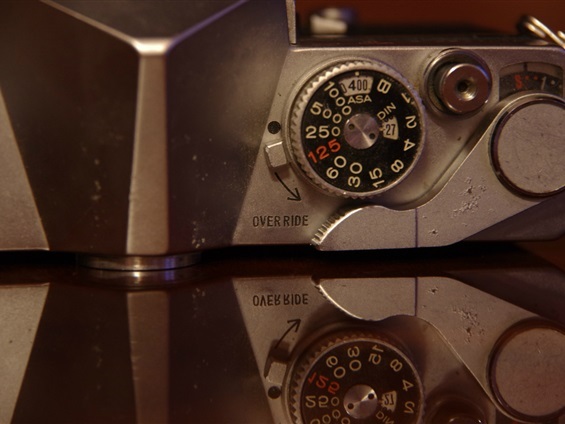 Not TTL metering, but a well working automatic shutter time priority system, based on metering through the eye on top of the dial at the right front. Weight: 721 gr. Size: 144x93x50 mm. Sn. : 930559. 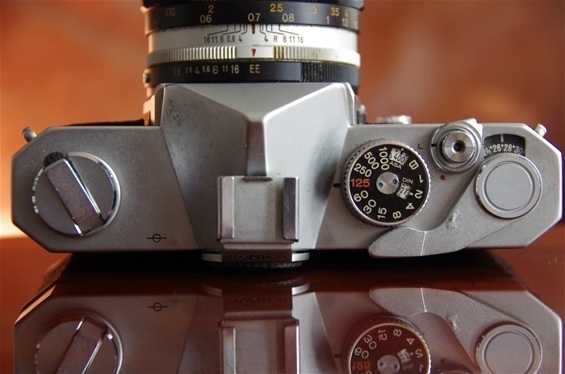 This camera also introduced a choice between 24x36 and 24x16 mm frame by a handle at the top. Also note the small but effective rewind crank to the left, the window at the left prism, giving more light to the aperture scale in the viewer and the ASA setting and the shutter time dial at the front wall, surrounding the metering eye. The first high quality EE Hexanon lenses came with this camera. 52/1,8. Sn. : 4524555. On/Off switch with battery check. To switch between full and half frame one would follow some guidelines. 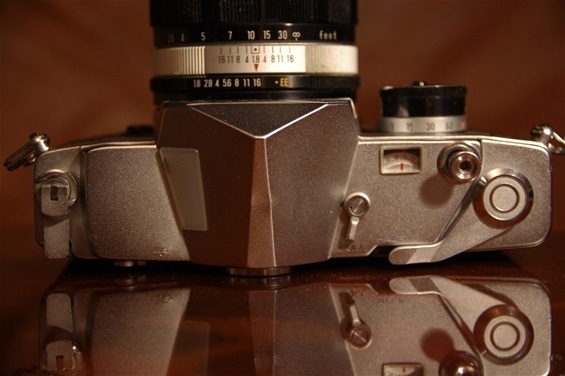 This is the Autoreflex T of 1968. However, the model released in 1970 is the by far most common. Without any T2 marking, few are aware of the differences. 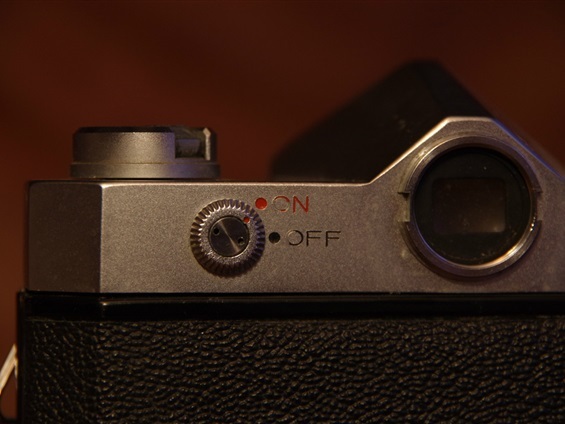 This first edition was the first to offer automatic aperture settings at full opening when choosing shutter speed. These features were the same on both models. Only some knobs and switches differed. Weight: 751 grams. Size: 146x92x47 mm. Sn. 709564. Not by the release button, as was the case on the T2. 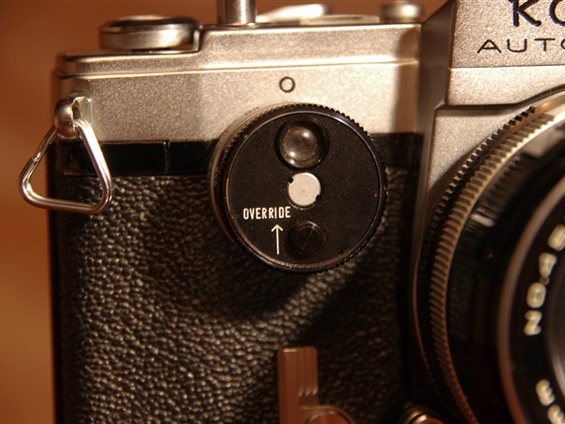 An override switch by the shutter speed dial. 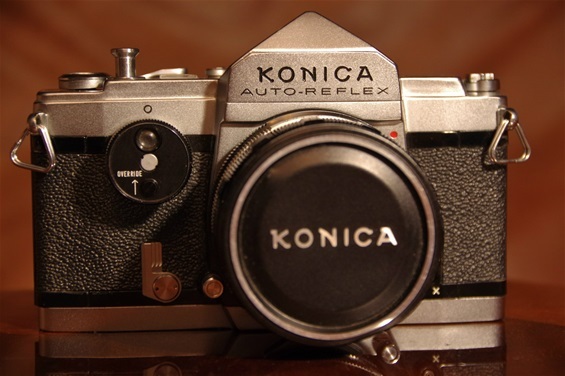 The second edition of Konicas biggest hit, the Autoreflex T2 of 1970. This sample, though not not marked with any 2, is a T2, recognized first of all by the on/off switch in front of the trigger. (And perhaps by some paint coming off the Konica logo). Weight: 744 gr. Size: 146x92x47 mm. Sn. 122612. 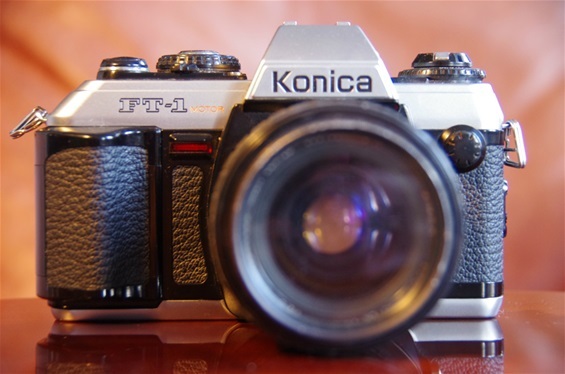 The last Konica produced PP SLR, the FT-1 Motor, produced from 1983 till 1987/88. 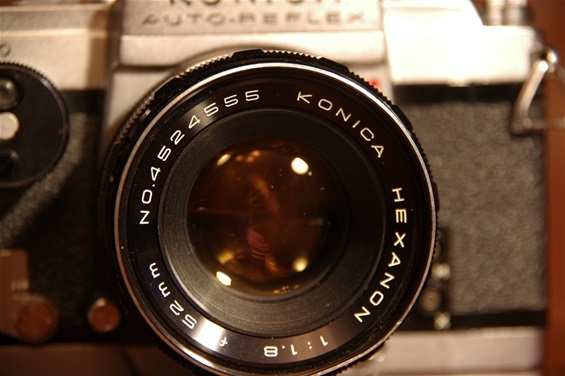 (Note: There was a Konica TC X introduced in 1984, but produced at Cosinas, and discontinued in 1987.) 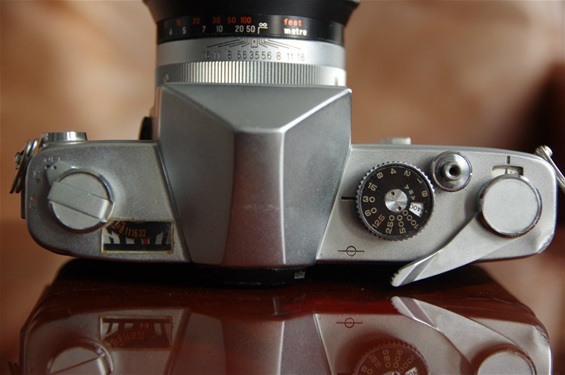 The built in motor was, except for the Zenit 5 in 1964, though more advanced, another worlds first for Konica, first presented on the FS-1. Size of FT-1: 147x93x41mm. Weight: 604 grams. Sn. 402505. This FT-1 was following the FS-1, worlds first PP SLR without manual winder as the winding and rewinding was done by a built in motor. Hi, nice site. 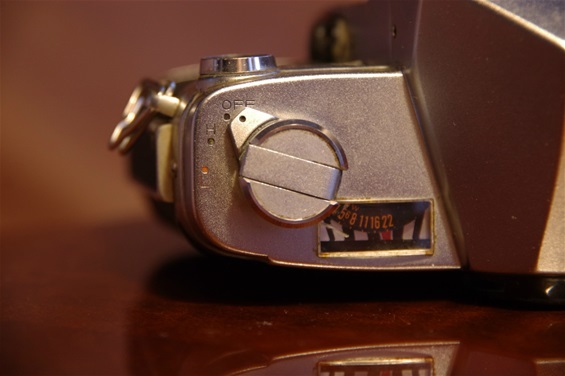 Just a little errata: The Konica FT-1 motor was the 2nd Konica SLR with a built-in motor winder. 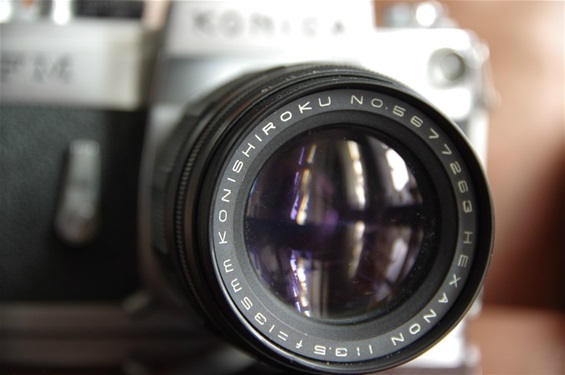 The 1st was the Konica FS-1 introduced in 1978.